Former five-star recruit Priest Willis has decided to transfer out of UCLA, becoming the second Bruin cornerback to do so in the span of a week. The news of Willis’ departure, first reported by Bruin Report Online, follows Jalen Ortiz’s announcement last Tuesday that he would leave UCLA. Neither player was going to break into the Bruins’ starting lineup anytime soon, but Willis at least had a chance to be on the two-deep. Instead, his UCLA career has ended after just two seasons, with the once-touted defensive back prospect appearing in 20 games. The Arizona native leaves Los Angeles with 27 tackles, three pass breakups and an interception. Willis still has a redshirt year available, and will preserve two seasons of eligibility at his new school. 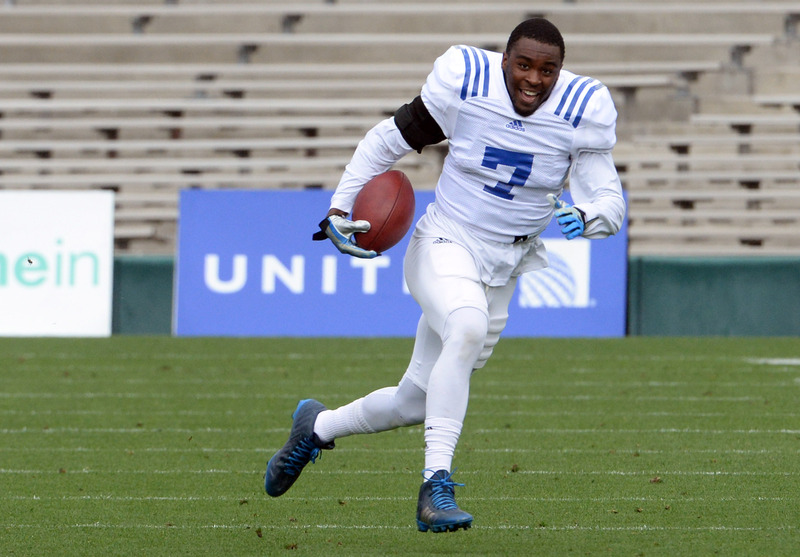 UCLA cornerback Johnny Johnson runs with the ball during the Bruins’ “Spring Showcase” at the Rose Bowl on April 24, 2015. Like UCLA’s offensive line, the secondary is a unit that has grown significantly during the Jim Mora era. Back in 2012, the Bruins were maligned for their pass defense, one that ranked eighth in the Pac-12. In the last two years, they haven’t ranked lower than fourth. With every starter returning, there’s plenty of depth in the defensive backfield, one that has emphasized positional versatility to facilitate the use of shifting schemes and to better secure against injuries. This fall, the X-factor will be whether or not any one player makes the leap into becoming a dominant, shutdown corner. UCLA defensive back and returner Ishmael Adams injured his ankle in Saturday’s 38-20 win against USC, and remained limited during Monday’s practice. However, head coach Jim Mora sounded optimistic about Adams’ chances to return against Stanford this Friday to help the Bruins clinch the Pac-12 South. The 5-foot-8 corner has returned two interceptions for touchdowns this season, as well as 100-yard kick return score. He also has 33 tackles and four pass breakups. 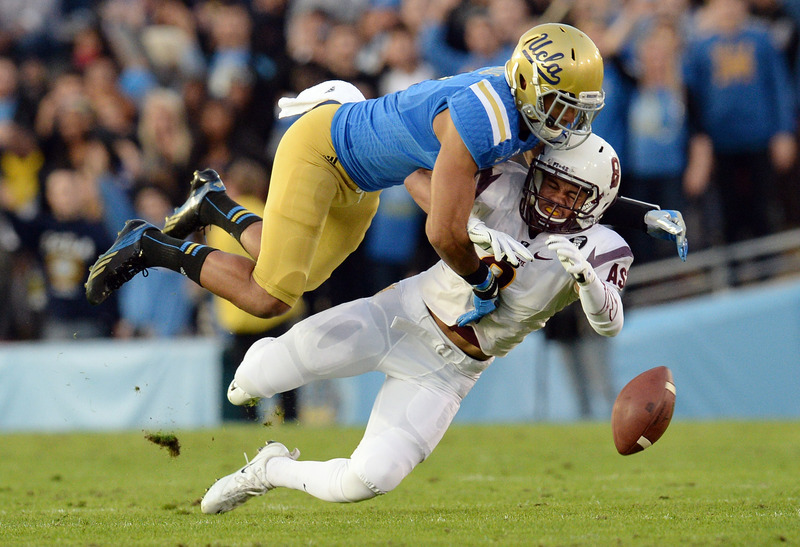 » A trio of true freshmen were left off UCLA’s training camp roster. Quarterback Aaron Sharp, linebacker Dwight Williams and receiver Jordan Lasley did not practice on Monday, and will not return to the team until Aug. 31, after UCLA’s season opener at Virginia. “Those three guys did not live up to the standards that we’re looking for through the summer months,” head coach Mora said. None of the three were expected to contribute immediately. » Receiver Darren Andrews is officially out for the season after undergoing microfracture surgery on his knee. He will redshirt the upcoming season after initially tearing knee ligaments late last November, ending a season in which he caught four passes for 52 yards. Cornerback Johnny Johnson is also out for the season after injuring his shoulder for the second year in a row. He had already redshirted the 2013 campaign. » Promising inside receiver Mossi Johnson injured his left shoulder on Monday, and left the field with a UCLA staffer helping him hold his arm still. Mora said he hoped it was just a mild AC sprain. Johnson played well in spring camp, and was likely the first receiver off the bench for either Devin Fuller or Thomas Duarte. UCLA is very familiar with offense-to-defense success. With the last project off to the NFL as a top-ten pick, can the Bruins duplicate that sort of transformation?